During the colder months feral rats and mice often become more visible in and around homes as they look for a warm place to nest and breed. This leads many people to put out various rat baits and poisons to rid themselves of these unwanted pests. However our domestic pets can sometimes fall victim to these poisons when they either ingest them directly or ingest the poisoned rodent itself. 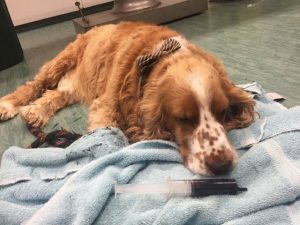 Unlucky Uni Vets Pet Sunny had to be rushed to the clinic for this very reason earlier this year, after he ingested five sacks of rat bait. Thankfully Sunny’s human brought him into the clinic within a few hours of the incident, making the prognosis quite good as timing is critical in rat bait poisoning cases. The sooner a pet is treated by a veterinarian, the less likely significant amounts of the toxin are absorbed. Symptoms of rat bait poisoning can include coughing, difficulty breathing, lethargy, weakness and bleeding from the mouth, nose or eyes but are often only seen days after the pet eats the rat bait. By that time, the risk of death is very much higher. Sunny, pictured during his hospital stay, made a full recovery in large part because his owners sought veterinary assistance immediately. spect they have ingested rat bait, it is essential to get them to the vet as soon as possible. If you can also bring the packet, that can be very helpful. Early, rapid treatment is both cheaper and gives your pet the best chance of life. No rat baits are safe for pets regardless of what the label says.